Hundreds of books about the Middle Ages are published each year. They cover a vast number of topics, sometimes offering new research, sometimes retelling stories for new audiences. What makes one book stand out above the rest? I’ve made it a habit the last few years of keeping track of as many new books about the Middle Ages as I can – a process that leads me to visit many libraries and book stories. I can’t possibly get familiar with all the works that have come out, so my choices are subjective, but I think the books mentioned below will prove to be important contributions to medieval studies. I look for those that I think will enlighten and expand our understanding of the Middle Ages, that are well written and well researched, and will have lasting significance in their field. 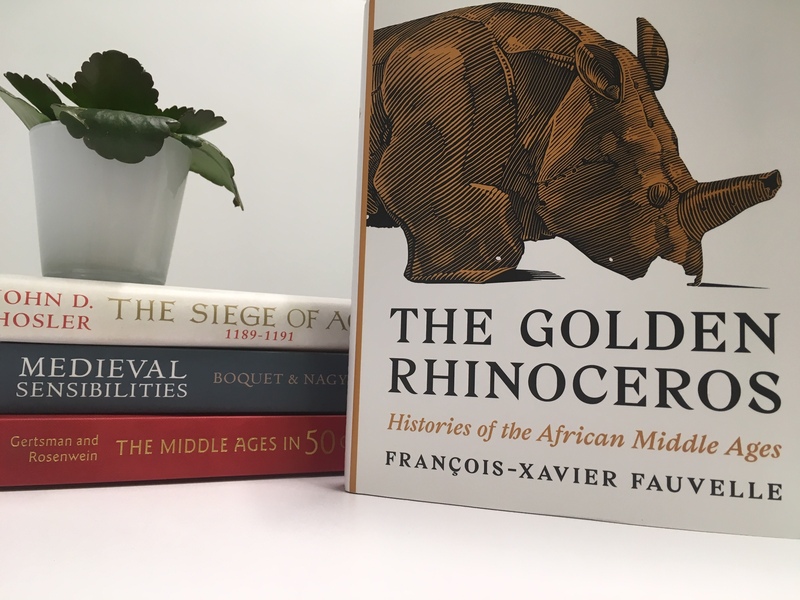 The Golden Rhinoceros: Histories of the Africa, by François-Xavier Fauvelle, is my choice for the medieval book of the year. It’s not a particularly large book at just 264 pages, but it offers readers a great trove of topics related to the medieval history of Africa (with the exception of Egypt and the Mediterranean coast). It consists of 34 separate stories, each about six to eight pages long. They cover events between the eighth and fifteenth centuries, and zig-zag across the African continent, so you will be at first reading about Mauritania, then going to Zimbabwe, and then off to Ethiopia. Fauvelle is highly effective in giving us snapshots of life in these places, all the while acknowledging that his sources are often fragmentary and sparse. Fauvelle’s aim in this book is to show that Africa was not mired in the ‘dark centuries’ as many historians have assumed, but was going through something more akin to a ‘golden age’ during the Middle Ages. Many of his sections reinforce the idea that merchants were flourishing in medieval Africa, with gold and slaves being sent across the continent into the Arab world, India, and even to China. Perhaps medievalists have been too focused on the connections between medieval Europe and Africa, which are very limited, and haven’t yet researched the much deeper relations between the Islamic and African worlds. Here Fauvelle offers a guide to historians on how they can learn more about Mali, Somalia or the Sahara, and the role they played in the medieval world. A few other books from 2018 also deserve some praise. Medieval Sensibilities: A History of Emotions in the Middle Ages, by Damien Boquet and Piroksa Nagy, takes us into new fields as it talks about how people were dealing with emotions and feelings from the monastic community to the royal court. Like Fauvelle’s book, this was also originally published in French a few years ago and has gained glowing reviews. A lot of medievalists will pick up this book and find something here connected to their own research, whether it be on Thomas Aquinas or courtly love, and also gain a better understanding how medieval society changed over the course of the Middle Ages. John D. Hosler’s The Siege of Acre, 1189-1191: Saladin, Richard the Lionheart, and the Battle That Decided the Third Crusade is a book that should have been written decades ago. A story from the crusades that has a cast of some of the most famous medieval characters, it is also one of the best recorded accounts of medieval warfare that exists. Hosler makes use of all that to give us a book that will get both a lot of reads and just as many citations. The Middle Ages in 50 Objects, by Elina Gertsman and Barbara H. Rosenwein, is one of those books that is a joy for a medievalist to flip through. They show everything from small ivory sculptures to leafs from manuscripts, with each object getting about four pages devoted to its story. This book is something that can really inspire the wider audience to learn more about the Middle Ages, showing them just how beautiful the art of the period really was, and how we can learn about the past from these items.